CLASSES ARE OFFERED ALL YEAR LONG AND WE WELCOME ANYONE WHO IS INTERESTED IN LEARNING IKEBANA. ONE DAY WORKSHOPS WILL ALSO BE AVAILABLE IN THE FUTURE, CHECK EVENTS PAGE FOR DETAILS. 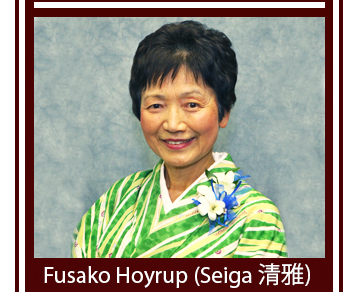 Mrs. Fusako “Seiga 清雅” Hoyrup, a principle teacher of the Wafu School of Ikebana and president of the school's California chapter, has devoted more than 50 years to the study and teaching of ikebana. She holds a Shukan Degree in Ikebana, which is the highest achievement level in the Wafu School and the equivalent of a Master's Degree. Mrs. Hoyrup has represented the Wafu School by giving lectures and demonstrations in Australia, Brazil, India, South Africa, and throughout the United States. Mrs. Hoyrup has received many public commendations for the recognition of her uncompromising devotion to ikebana. In February 2011, Mrs. Hoyrup was presented the Fremont Union High School District's highest award, the "Friend of Education" award, in recognition of her expertise in teaching and sharing the Art of Ikebana in the community of the Fremont Union High School District's Adult & Community Education Program. In January 2010, Mrs. Hoyrup was voted into the Bunka Hall of Fame (Class of 2009) presented by the prestigious Japanese American Association of Northern California (JAANC). In October 2015, the Consul General of Japan awarded Mrs. Hoyrup the prestigious Official Commendation for her long time contributions to the promotion of friendship between Japan and California through her ikebana activities. 2015 represents another milestone in Mrs. Hoyrup’s life as the California chapter celebrates its 45th Anniversary. The chapter and its students have been her life’s greatest joy, and the lives of others – teachers, students, friends, and associates – have in turn been deeply enriched by Mrs. Hoyrup’s contribution to the art of ikebana. 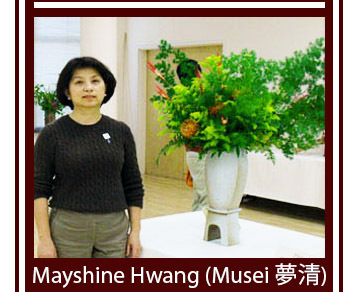 Mayshine “Musei 夢清” Hwang started to learn the Wafu School of Ikebana in December 1993. Since then, she has been studying Wafu Ikebana enthusiastically till present. She received the Teaching diploma August 2001, the Sanyo degree in January 2007 and received the Somu degree in November 2012 from the Wafu School Headquarters in Tokyo Japan. She has been an active member of the Ikebana Teacher’s Federation, participating in their events demonstrating the style of Wafu ikebana. Her creative abilities, Ikebana techniques, and material combinations are exquisite. Thanh “Kosen 紅泉” Nguyen was introduced to Ikebana at an early age in Vietnam but only had the opportunity to study this art after she came to the USA. She was born in Vietnam into a family of 12 children. Twice her family left everything behind to escape to South Vietnam and later to America. She left Vietnam after the fall of Saigon in 1975 and after settling here she worked during the day to raise two daughters and went to school at night. She graduated from San Jose State University in Marketing and Engineering and worked for 25 years in the hi tech industry. After retirement she turned her energy to teaching Ikebana in Palo Alto, Menlo Park and to directing a senior program in Palo Alto. Thanh has studied Wafukai Ikebana with Fusako Hoyrup for over 20 years. She received her teaching degree in 1997 and the Gakukan degree in 2016. She is the current President of Ikebana International, San Francisco Bay Area Chapter. 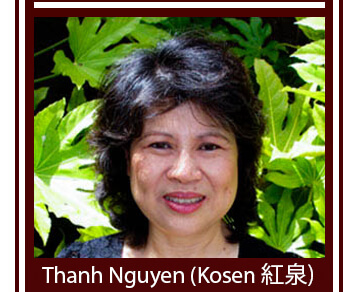 She serves on the Board of Directors of Ikebana International, San Francisco Bay Area Chapter. She also is a member of Wafu Society and the Ikebana Teachers Federation. She has demonstrated and exhibited her work at many flower shows in the Bay Area and yearly at her own show with her students in Palo Alto. In addition to her accomplishments in Ikebana, Thanh plays the Chinese harp, paints, and is a gourmet cook who gives cooking demonstrations.